A film noir focusing on a flawed detective, Where The Sidewalk Ends hits many of the right dark notes but falls just short of perfect sharpness. 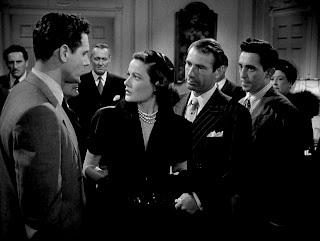 In New York City, police detective Mark Dixon (Dana Andrews) is warned about his violent methods. Too quick with his fists, Dixon's hatred of hoodlums stems from wanting to distance himself from the memory of his father, an infamous thief. Dixon and his partner Klein (Bert Freed) investigate the murder of Texas businessman Morrison, stabbed to death by abusive low life Ken Paine at an illegal gambling joint run by notorious criminal Tommy Scalise (Gary Merrill). Dixon tracks down Paine and accidentally kills him with a punch. In a cold panic, Dixon decides to cover up his role in Paine's death, and works to implicate Scalise for the murders of both Morrison and Paine. In the meantime Dixon also starts to fall in love with Paine's estranged wife Morgan (Gene Tierney). But when Morgan's father Jiggs (Tom Tully) becomes the chief suspect in Paine's murder, Dixon finds his troubles multiplying. Where The Sidewalk Ends reunites director Otto Preminger with stars Dana Andrews and Gene Tierney, the talent trio responsible for 1944's Laura. And with a script by Ben Hecht, Where The Sidewalk Ends gets many things right. The black and white photography is rich with bright light sources cutting through imposing shadows, heavy coats, glistening streets, neon signs and an abundance of hooligans. Mark Dixon as the central protagonist is a deeply damaged man, fighting internal demons with a career rumbling in reverse gear. And the plot is filled with just enough complexity and coincidence to highlight the ironies of life without slipping into irrational territory. The film's texture is enhanced by several nice touches. Mobster Scalise is smooth as silk, Gary Merrill perfecting a condescending smarm and augmenting it with constant sniffing of an unknown substance to keep his airways clean and his brain in overdrive. Dixon's partner Klein is also hard headed but has it under control, and gets a moment to shine with his wife when Dixon comes calling for financial help. And an assortment of secondary characters including a taxi driver, a dotty neighbour, a caustic diner waitress, an ex-convict on parole and numerous hissing musclemen add animation at every turn. Karl Malden shows up as the newly minted Lieutenant at Dixon's precinct. 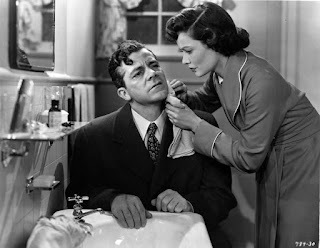 While Dana Andrews does well and has plenty to bite into as the emotionally distressed Dixon, the character of Morgan is less successful. Gene Tierney is generally unable to do much with the underwritten role of a too-good woman with poor judgement in men. And while Hecht's writing is sturdy, it lacks a cutting edge in dialogue exchanges that sound appropriately belligerent but lack in wit. Where The Sidewalk Ends is worthwhile place to visit, one detective finally running out of fist room in the confrontation with the ghost of his father's legacy.